NOAA Ocean Explorer:Gulf of Mexico: Brine Pool and other Brine Lakes in the Gulf of Mexico. 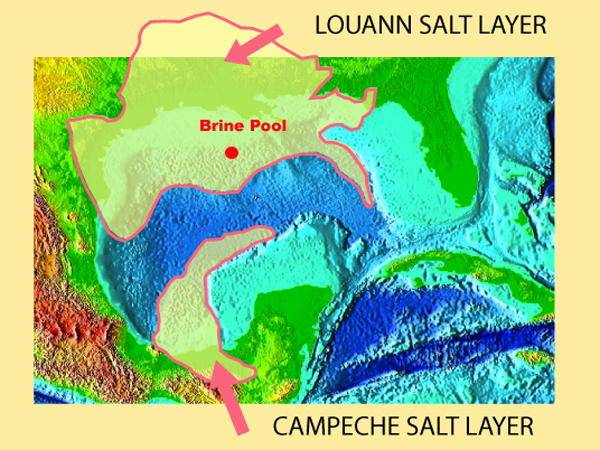 The Brine Pool and other brine lakes in the Gulf of Mexico are caused by dissolution of buried salt deposits created during a time when the Gulf dried out. Now broken into two large sheets, movement of the salt sculpts the seafloor, which creates unique habitats. (For full illustration based on work of James Pindell, Lorcan Kennan and Stephen Barret Click here ) Image courtesy of Gulf of Mexico 2002, NOAA/OER.